InfoSec Handlers Diary Blog - After Flash, what will exploit kits focus on next? SANS ISC: InfoSec Handlers Diary Blog - After Flash, what will exploit kits focus on next? Adobe has received some bad publicity regarding zero-day Flash player exploits due to the recent Hacking Team compromise [1,2]. This certainly isn't the first time Adobe has had such issues . With HTML5 video as an alternative to Flash player, one might wonder how long Flash player will be relevant. Google has announced the next stable version of Chrome will block auto-playing Flash elements , and Firefox started blacklisting Flash player plugins earlier this week . With people like Facebook's chief security officer calling for Adobe to announce an end-of-life date for Flash , I've been wondering about the future of Flash player. More specifically, I've been wondering what exploit kit (EK) authors will turn to, once Flash player is no longer relevant. In recent months, most EK traffic I've generated used a Flash exploit to infect vulnerable Windows hosts. The situation with Flash player today is much like the situation with the Java that I remember back in 2013 and most of 2014. However, in the fall of 2014, most EKs dropped Java exploits from their arsenal and started relying on Flash player as a vehicle for their most up-to-date exploits. Java exploits were prevelant when I first started blogging about EK traffic in 2013 . Back then, Blackhole EK was still a player, and I commonly saw Java exploits in EK traffic. The threat landscape altered a bit when the EK's alleged creator "Paunch" was arrested. Organizations that monitor EK traffic noticed a sharp reduction of Blackhole EK traffic in 2014 compared to the previous year . During that same time, I started noticing more Flash exploits in EK traffic. By September 2014 most of the remaining EKs stopped using Java. My last documented dates for Java exploits in exploit kit traffic are below (read: exploit kit name - date Java exploit last seen). Of note, FlashPack EK and Sweet Orange EK have disappeared, and they are not currently a concern. Neutrino EK was dormant from April through October of 2014, and when it came back, I didn't see it using any Java exploits. Fiesta EK still sends several different types of exploits depending on the vulnerable client, and it still has Java exploits in its arsenal. Other lesser-seen EKs like KaiXin still use Java exploits. However, the majority of EKs gave up on Java sometime last year. Most exploit kits use the latest available Flash exploits. Angler, Neutrino, Nuclear, Magnitude, and Rig EK are all using the latest Hacking Team Flash player exploit based on CVE-2015-5122 . If you have Flash player on a Windows computer, you should be running the most recent Flash update (version 18.0.0.209 as I'm writing this). Earlier I generated Angler EK traffic to infect a Windows host running Flash player 18.0.0.203 on IE 11. 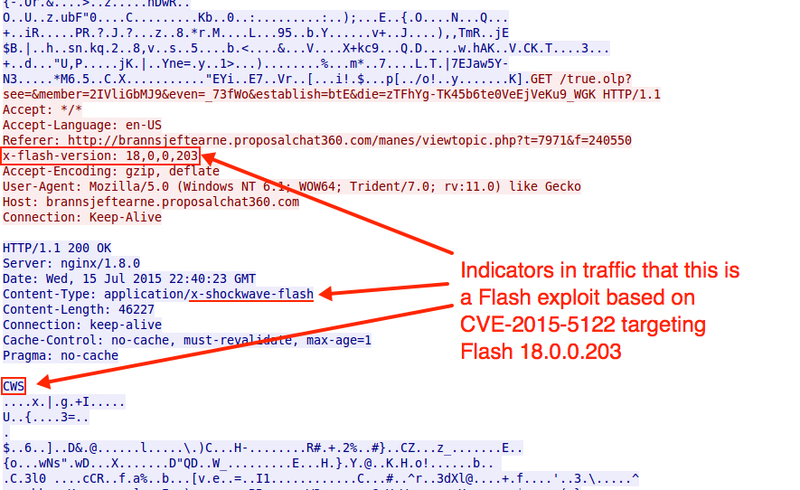 Angler sent a Flash exploit based on CVE-2015-5122, and the EK sent CryptoWall 3.0 as the malware payload. Shown above: An image of the Angler EK infection and post-infection CryptoWall 3.0 traffic in Wireshark. Click on the image for a full-size view. Shown above: Angler EK sending a Flash exploit, based on CVE-2015-5122, targeting Flash 18.0.0.203. 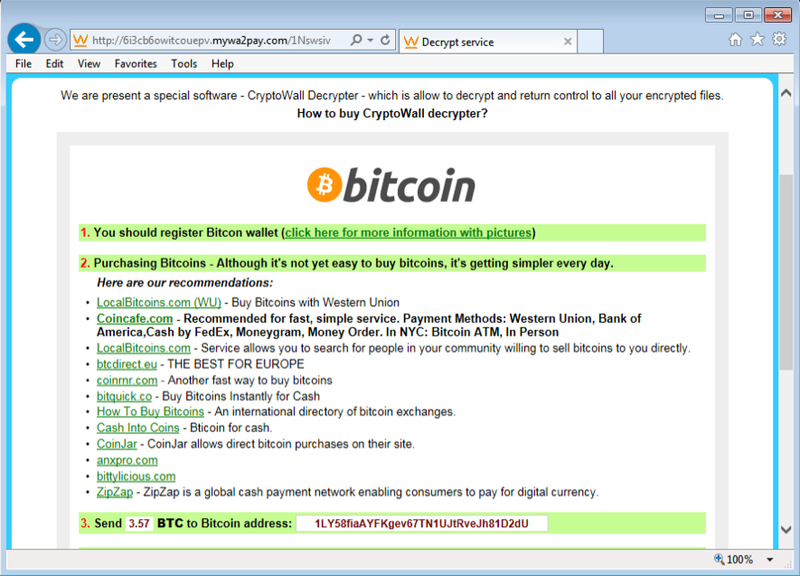 The infected host's bitcoin address for ransom payment was 1LY58fiaAYFKgev67TN1UJtRveJh81D2dU. The address is the same one seen on 2015-07-01 and also documented in my previous diary on CryptoWall 3.0 . Shown above: Decrypt instructions from the infected host. Today, the majority of EKs utilize Flash player exploits based on the most recently known vulnerabilities. But this situation can't last forever. If Flash is no longer relevant, what will EK authors turn to for their latest exploits? Will they go back to Java? Will they focus on browser vulnerabilities? It will be interesting to see where things stand in the next year or so.